NASA’s Mars Reconnaissance Orbiter passed a mission milestone of 40,000 orbits on Feb. 7, 2015, in its ninth year of returning information about the atmosphere, surface and subsurface of Mars, from equatorial to polar latitudes. The mission’s potent science instruments and extended lifespan have revealed that Mars is a world more dynamic and diverse than was previously realized. Now in its fourth mission extension after a two-year prime mission, the orbiter is investigating seasonal and longer-term changes, including some warm-season flows that are the strongest evidence so far for liquid water on Mars today. The orbiter has returned 247 terabits of data, which is more than the combined total from every other mission that has ever departed Earth to visit another planet. It circles Mars at an altitude of about 186 miles (300 kilometers), on a near-polar pattern, about 12 times a day. In its 40,000 orbits, the spacecraft has flown nearly twice as far as the 310 million miles (500 million kilometers) it flew during its 2006 journey from Earth to Mars. The mission has illuminated three very different periods of Mars history. Its observations of the heavily cratered terrains of Mars, the oldest on the planet, show that different types of ancient watery environments formed water-related minerals. Some of these environments would have been more favorable for life than others. In more recent times, water appears to have cycled as a gas between polar ice deposits and lower-latitude deposits of ice and snow. Extensive layering in ice or rock probably took at least hundreds of thousands, and possibly millions of years to form. Like ice ages on Earth, the layering is linked to cyclic changes in the tilt of the planet’s rotation axis and the changing intensity of sunlight near the poles. 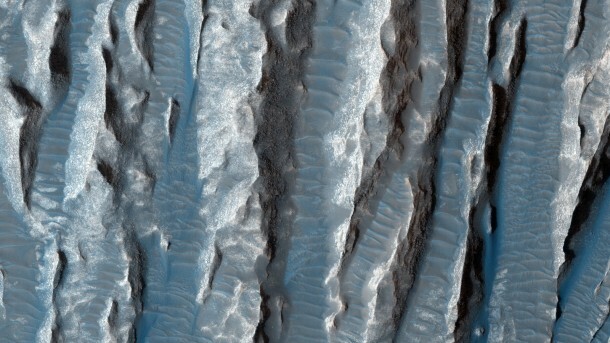 Mars’ present climate is also dynamic, with volatile carbon dioxide and, just possibly, summertime liquid water modifying gullies and forming new streaks. With observations of new craters, avalanches and dust storms, the orbiter has shown a partially frozen world, but not frozen in time, as change continues today. In addition to accomplishing its own science achievements, the Mars Reconnaissance Orbiter mission provides communication relay for missions on the surface of Mars and evaluates potential landing site candidates for surface missions. Two other active NASA spacecraft are currently orbiting Mars — Mars Odyssey since 2001, and MAVEN (Mars Atmosphere and Volatile Evolution) since last year. Two NASA rovers — Opportunity and Curiosity — are active on the surface. These robotic missions and others in development are paving the way for human-crew Mars missions in the 2030s and beyond as part of NASA’s Journey to Mars strategy.